By far, stone tools make up the majority of the small finds we handle each day. Even for a settlement site, both the East and West trenches are unearthing tools in unusually large quantities. Due to both the long history of use and the frequent employment of naturally shaped pebbles, these tools are extremely difficult to date. While they are common within our Eighteenth Dynasty contexts, we must admit that the area around the local medieval church is also littered with identical examples. The use of the natural rock shape can hamper the recognition and identification of these objects, and we were lucky to receive a crash course from Silvia Prell, an expert on macrolithics, who was here at Sai for the beginning of the season. This year, the most commonly represented types of tool are pounders; heavy pebbles that can be used to grind and mix material against a slab of stone. These can come in multiple shapes and sizes, as well as a variety of materials. One of the numerous pounders from SAV1 East (SAV1E 1823). The example shown here (SAV1E 1823) is made from a quartz pebble, which are extremely abundant on the Island. Despite being broken in half, it is clear that the tool was roughly spherical in shape, with percussions marks present along the entire circumference, thus indicating that it was well used. Hand mills and grindstones, which are used together, are the next most common stone tools from Sai with 175 and 142 pieces already registered this year. Both are usually made from quartzite, although it is also possible for them to be made out of sandstone. Though some complete examples have been found, many are highly fragmentary, such as this hand mill (SAV1W 1189). 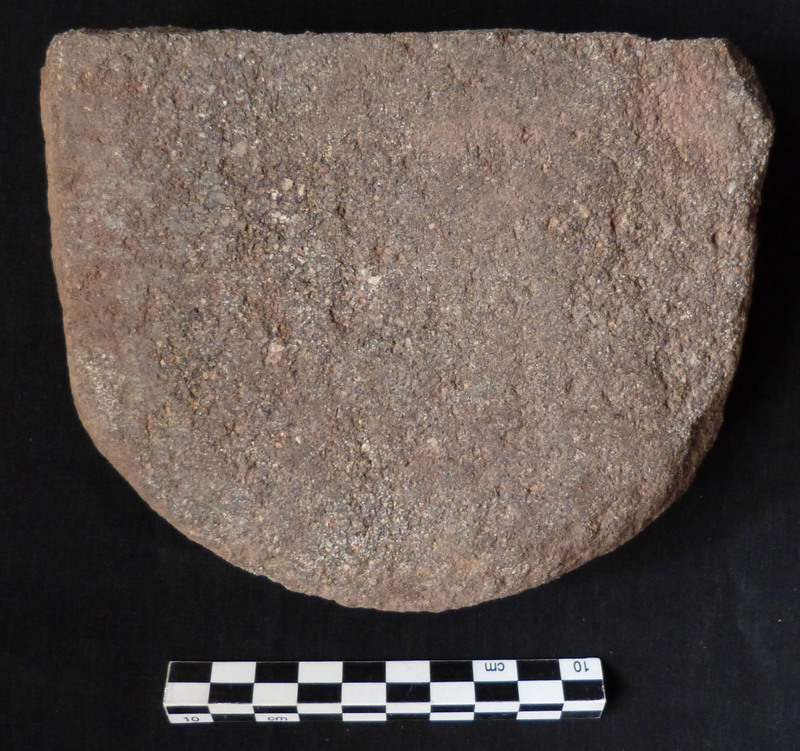 Fragmentary hand mill from SAV1 West (SAV1W 1189). This season 173 whetstones have been registered into the database. A whetstone, mainly in the form of a piece of sandstone, is a sharpening stone used for knives and other cutting tools. 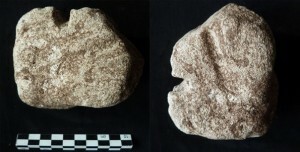 SAV1W 720 is a good example of this in which multiple faces of the stone were utilized, as can be clearly seen by the deep grooves on the surface. Example of a whetstone from SAV1 West (SAV1W 720). In our last blog post we asked our readers for comments and suggestions on a curious fragment of wood. We are grateful for all your suggestions on the identity of this object! This week we have an even stranger object for you to ponder. Another curious object – this time in stone and from SAV1 West (SAV1W 1184). SAV1W 1184 is a small natural pebble, irregularly shaped, which seems to have been worked. Small grooves appear to be carved at fairly regular intervals on the stone. Is this really a worked stone or is it simply the work of nature? If worked, what might this object represent and how old is it? 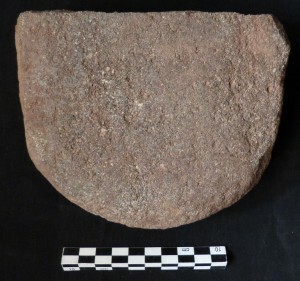 This entry was posted in 18th Dynasty, Archaeology, Fieldwork, Material Culture, New Kingdom, Sai Island and tagged pounder, small finds, stone tools, whetstone by Kenneth Griffin Meg Gundlach. Bookmark the permalink. The stone tools found this season are interesting indeed. Also, the amount found, especially of the milling and pestle tools, is of interest, opening a large area of the field for the accurate search for re-use of the buildings. I wonder also about the quality of residence and the number and quality of foods used. Do the tools reflect the use by the general public or a more closely defined group? Are local stones used or imported and if so, from where? Could it be that it was originally part of a statuette, and then later was used as a stone tool, and thats why it looks so smoothed and worn?